Philoctetes is the name given to a hero of Greek mythology; a Greek hero who was a Suitor of Helen, a fighter at Troy, and one of those Achaean heroes who hid within the Wooden Horse. In antiquity though, Philoctetes was far more famous than he is today. Philoctetes was the son of Poeas and his wife Demonassa (or Methone). ​Poeas was king of Meliboea in Thessaly, but he is more famous as a hero than a king, for Poeas was often named as one of the heroes who sailed on the Argo with Jason. Philoctetes himself comes to prominence with the death of another Greek hero, indeed the greatest of all Greek heroes, Heracles. The common story tells of Heracles dying after being infected with the poisonous blood of the Lernaean Hydra, having worn the robe presented by his wife Deianira. This robe was the Shirt of Nessus which was coated in the blood of the dead centaur whom Heracles had previous killed. Heracles recognised that he was dying, for nothing could be done to cure him of the blood of the Hydra, and so, in Trachis, Heracles constructed his own funeral pyre, but no-one would light the pyre for him. Heracles called upon all those who passed by the pyre to light it, but everyone refused until Philoctetes passed by. Philoctetes did not expect payment for helping out Heracles, but in gratitude Heracles gave Philoctetes his famous bow and arrows. This act of Philoctetes allowed for the Apotheosis of Heracles, and Heracles was thus transported to Mount Olympus. ​Other versions of the myth tell of the funeral pyre being lit by Poeas, an old comrade of Heracles, for both had been Argonauts, and it was from his father, that Philoctetes inherited the bow and arrows of Heracles. Alternatively, Philoctetes was not a passer-by, but was already a companion of Heracles, and his armour bearer, who had been with the hero when he was poisoned. Poeas had been a fine archer, indeed the finest amongst the Argonauts, and he would pass on his knowledge and skill to Philoctetes, but Philoctetes’ skill would far outstrip that of his father, and by the time he was of age Philoctetes, was known as amongst the top archers of the ancient world. It was therefore only natural that when news came that Helen, the stepdaughter of King Tyndareus of Sparta, was accepting marriage proposals, Philoctetes set out for Sparta; and there, Philoctetes would become one of the Suitors of Helen. In Sparta, Philoctetes would also be one of the heroes who took the Oath of Tyndareus, prior to the new husband of Helen being chosen. ​The Oath was designed to prevent bloodshed amongst the Suitors, but it also made those who swore the oath, honour bound to protect the man chosen. Philoctetes was ultimately unsuccessful in winning the hand of Helen, for Menelaus was chosen. Later, of course, Helen was abducted and all those who had taken the Oath of Tyndareus were called to arms to retrieve her from Troy. ​Thus, when the fleet gathered at Aulis, Philoctetes was in charge of seven ships combining troops from Meliboea, Methone, Olizon and Thaumacia, and Philoctetes was named as one of the Achaean leaders. When the ships of Philoctetes arrived at Troy though, they were no longer under his control, for Medon, half-brother of Ajax the Lesser, was now in command, and Philoctetes was no longer with the Achaean force, for he had been left behind upon Lemnos (or Chryse, or Tenedos). 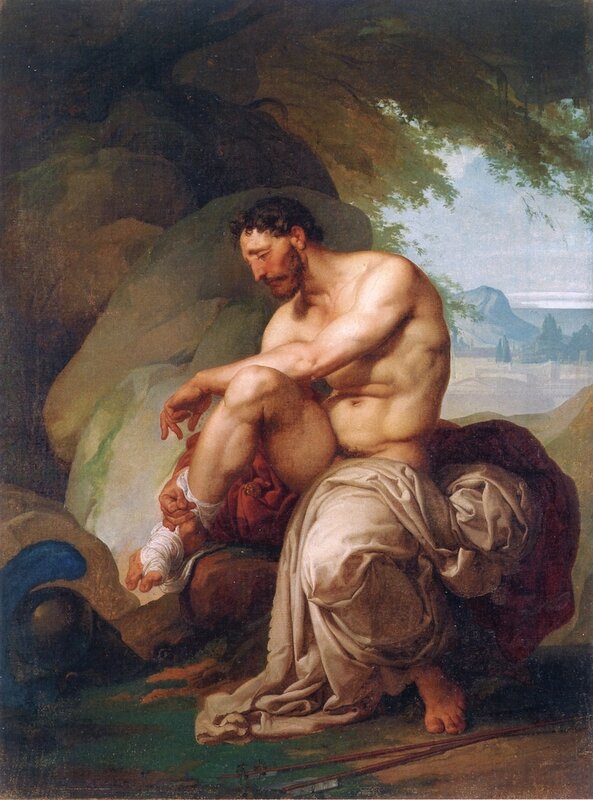 The reason for the abandonment of Philoctetes was due to the fact that the Greek hero was suffering from a festering wound caused by a snake bite, a wound that caused Philoctetes great pain, and emitted a gut-wrenching odour. One version of the story tells of Philoctetes being bit by a snake at the altar of Athena upon the island of Chryse. ​Alternatively, Philoctetes was bitten by a snake sent by Apollo, when King Tenes of Tenedos, a son of Apollo, was killed by the Achaeans when en route to Troy. More commonly, the snake bite was said to have occurred on Lemnos, when the goddess Hera sent a snake to bite Philoctetes; Hera being angry with Philoctetes for the assistance given to her nemesis Heracles when he was dying years before. No matter what the cause of the snake bite, Odysseus persuaded Agamemnon and Menelaus that Philoctetes should be left behind, for there was little doubt that the hero would die from his wound. In the tenth year of the Trojan War, Helenus, the Trojan seer, revealed to the Achaeans that Troy would not fall unless the bow and arrows of Heracles were used in the fight. These were of course the weapons of Philoctetes, left behind upon Lemnos. A small force was dispatched by Agamemnon to bring the weapons to Troy, and this force was normally said to have been led by Odysseus and Diomedes, although Neoptolemus is also often said to have been present as well. The Achaeans who arrived on Lemnos expected to simply take the bow and arrows of Heracles from where they lay, next to the body of Philoctetes, but of course, Philoctetes was not dead, and now they were faced with trying to convince a man they had abandoned to help them. Some tell of Odysseus actually tricking the weapons out of the hands of Philoctetes, but it was also said that Diomedes refused to take the weapons and leave the man behind. Diomedes might have been able to convince Philoctetes to return with him to Troy, but it was also said that it was only when Heracles, now a god, appeared, that Philoctetes agreed to go to Troy. Salvation for Philoctetes as at hand upon the Troad, for the sons of Asclepius, Machaon and Podalirius, were present in the Achaean camp. Machaon and Podalirius had many of the skills of their father, and they would cure the hero of his wound; though this does beg the question of why the wound was not originally healed upon Lemnos. A lesser told version of the Philoctetes myth, has the Greek hero cured of his wound before the return of Diomedes and Odysseus, for Pylius, a son of Hephaestus, and the priests of Hephaestus, upon Lemnos, had healed Philoctetes. In this version of the tale Philoctetes and Euneus had already undertaken much fighting, conquering islands near to Lemnos that had been settled by Carians. Philoctetes would get to fight at Troy as well, and amongst those that some say Philoctetes killed with his arrows included Acamas, Deioneus, Peirasus and Medon, although these names are not universal amongst the surviving sources. Philoctetes was though responsible for killing one important Trojan hero, for it was Philoctetes who killed the Trojan prince Paris. In some versions of the death of Paris, it was said that an arrow of Philoctetes went through his right eye, but others tell of how a poisoned arrow simply wounded the Trojan, but Paris subsequently died when Oenone refused to heal him. The death of Paris did not end the Trojan War though, and whilst Philoctetes and Neoptolemus were all for continuing the war through battle, other Achaean heroes, who had fought for ten years, instead looked to subterfuge to gain victory. Thus, the Wooden Horse was built, and when it was wheeled into Troy, by the unknowing Trojans, Philoctetes was present in its hollow belly. Philoctetes was therefore present during the Sacking of Troy, although he was not blamed for any of the sacrilege that took part during the fall of Troy. Despite being guiltless, Philoctetes struggled to return home, but eventually the Greek hero did return to his kingdom, but like so many other Greek leaders, he found that he was no longer welcome in his own homeland. ​Rather than attempt to retake his kingdom though, Philoctetes travelled onwards settling in the area known as Magna Graecia on the Italian Peninsula, where he was said to have founded the cities of Macalla, Petelia and Crimissa. In Crimissa, Philoctetes was said to have constructed a temple to Apollo where he laid up his famous bow and arrows. In antiquity the death of Philoctetes was never recorded, but in the 12th century AD, the Byzantine poet John Tzetzes told of the hero’s demise as he fought alongside Rhodian colonists in a local war.